Is mindfulness already a fad or doomed to become one? I started thinking about this recently after reading a blog post by Dr. David Allen, who wrote: "The latest fad in both psychotherapy and self help is 'mindfulness.'" While I agree with his article's point that it's better to help people change their environment if the environment is causing them distress, I thought calling mindfulness a "fad" seemed overly dismissive. Mindfulness is certainly becoming more popular. Multiple therapies have been developed in recent decades that incorporate it, including mindfulness-based cognitive therapy (MBCT), acceptance and commitment therapy (ACT), and dialectical behavior therapy (DBT). Jon Kabat-Zinn's mindfulness-based stress reduction (MBSR) program predates those therapies and has resulted in numerous books, CDs, and workshops. Google has a mindfulness class called Search Inside Yourself, and there's even a mindfulness conference for tech types, Wisdom 2.0. Has it all gone too far? To find some objective evidence, I used Google Trends to compare mindfulness with some other therapies that people may search for online. A fad is any form of behavior that develops among a large population and is collectively followed enthusiastically for a period of time, generally as a result of the behavior being perceived as popular by one's peers or being deemed "cool" by social media. A fad is said to "catch on" when the number of people adopting it begins to increase rapidly. The behavior will normally fade quickly once the perception of novelty is gone. Though the term trend may be used interchangeably with fad, a fad is generally considered a quick and short behavior whereas a trend is considered to be a behavior that evolves into a relatively permanent change. I turned to Google Trends again, this time comparing mindfulness to a few things that definitely struck me as fads: low carb diets, acai berries, and twerking (which granted may be more of an Internet meme). As you can see, mindfulness thus far has not behaved like these other fads. The low-carb craze was at a peak when Google first came to life in the early 2000's, dropping rapidly but having mini-peaks each new year as people explore dieting options. Searches for "acai" and "twerking" took off, but then fell fairly rapidly, though it seems the tails can stretch on for years. This graph seems to concur with my professional experience: when I ask my adult patients about their knowledge of mindfulness, out of 10 people, only 3 or 4 have ever heard of it, and out of those, only 1 might have a vague notion of what it means. 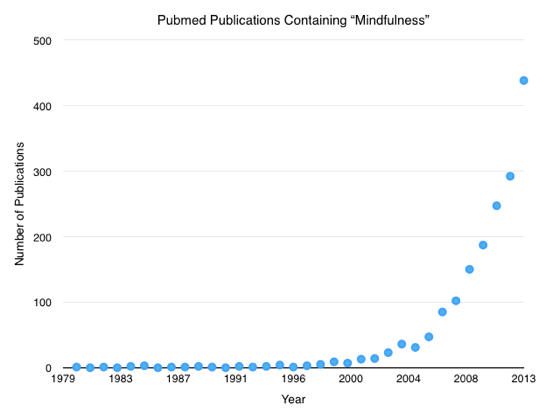 The enthusiasm for mindfulness is certainly more prevalent amongst therapists and academics than the general population, as shown by the rapid increase in Pubmed articles containing "mindfulness:"
I believe that this interest by itself does not constitute a fad, as long as the research bears fruit. 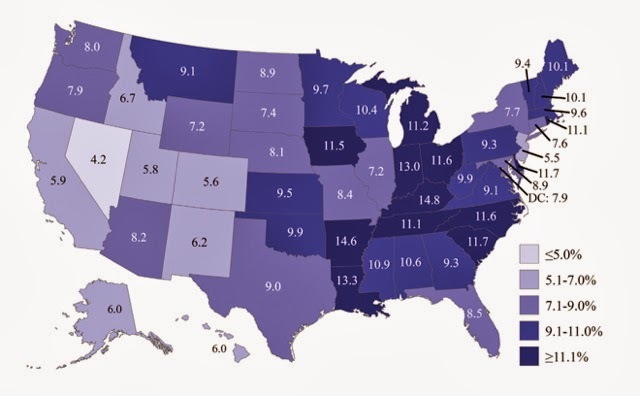 Time will tell, and based on my own experiences in using mindfulness-based approaches with my patients, I'm optimistic that the evidence base in support of mindfulness will only continue to grow. More worrisome is the possibility that corporate America may be (mis)using mindfulness to make its workers more productive and less stressed, rather than creating less stressful work environments. Other people more knowledgable about mindfulness than I have written thoughtful articles about the commercialization of mindfulness and its implications. I especially recommend Beyond McMindfulness by Ron Purser and Beyond McMindfulness: A Thoughtful Reply by Elisha Goldstein. You can certainly be forgiven for looking at the Time cover and thinking, "how can that not be a fad? Or at the very least a trend?" I would argue that mindfulness is neither of those things, since it's a concept that is so helpful for well-being, has been in use for thousands of years, and the idea of being present and focusing on the here-and-now is central to many therapeutic interactions. I would argue that mindfulness is analogous to physical exercise, which is also important for health. Nobody calls exercise a fad. But specific commercialized forms, endorsed by celebrities, overselling the benefits and underselling the necessary effort, can certainly constitute fads. 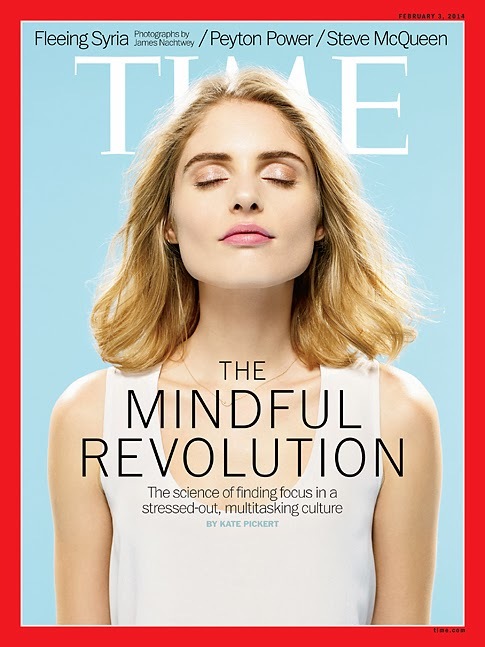 Putting Photoshopped blondes meditating on the cover of Time to sell magazines? I certainly hope that's a fad.